Barcelona, Spain – Woody Allen once said, "Eternity is a long time, especially towards the end." Volvo seems to have reached that point and has decided to completely update its best-selling XC60 after a long career that spanned ten years and over a million units sold. 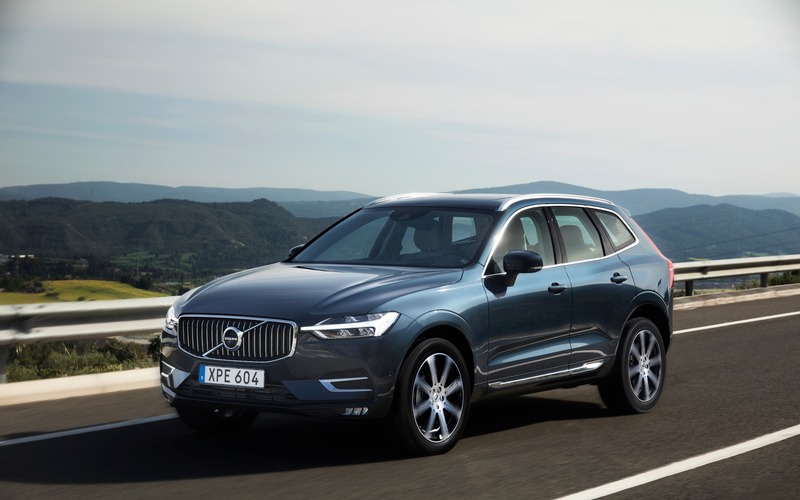 So it’s a fresh start for the Swedish brand whose renaissance began with the current XC90 and will continue with the arrival of the XC40, S60 and V60. These vehicles will follow the XC60 over the course of 2018. The XC60 borrows a lot of its style from the XC90’s refined look, but it adds a touch of dynamism thanks to a more aggressive front end design, a more pronounced windshield angle and the Thor’s hammer-shaped daytime running lights, which are integrated into the headlights. As for the size, this XC60 is 44 millimetres longer, 11 millimetres wider and 55 millimetres lower than the previous version. It’s a very contemporary look that should stand the test of time. From a technical standpoint, the XC60 is built on the SPA (Scalable Product Architecture) platform that is also the basis for the XC90, S90 and V90. It ushers in new technology for enhanced safety, which are detailed in another article that you’ll find on our site. 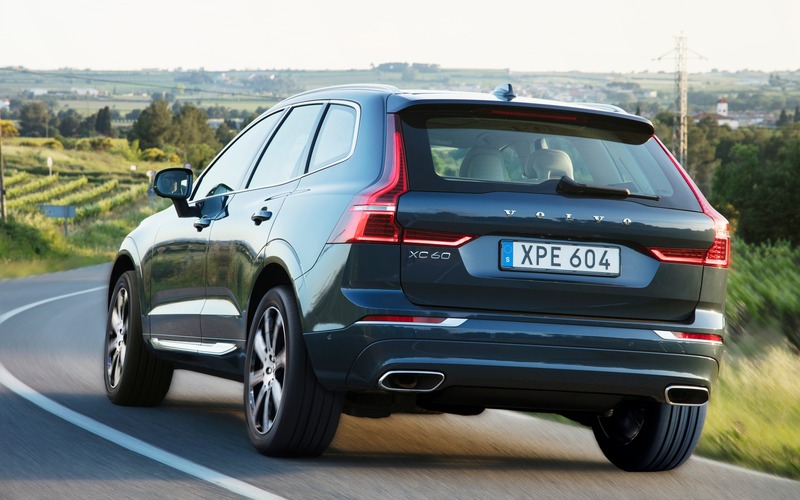 The cabin borrows heavily from the XC90. In fact, the touchscreen, steering wheel, central console, start button and driving mode selector—both of which made of serrated aluminum—are identical in both SUVs. On board, it becomes obvious rather quickly that the top-drawer look of the cabin helps the XC60 hold its own versus the category’s German heavyweights. On the high-end Inscription version, you’ll immediately notice the grey Driftwood accents enhanced with a touch of silver. The part that joins the central console to the right extremity of the passenger’s side is made of a single piece. That speaks to a meticulous assembly and an obvious attention to detail, both of which are turned up a notch when you notice the Swedish flag sculpted into the aluminum strip surrounding the wood accent. Did you know that this “flag” is actually a joint that allows the metal expand and contract with variations in temperature? Sublime. The colour touch screen and Sensus infotainment system introduced in the XC90 also find a home in the XC60, and Apple CarPlay and Android Auto come factory standard on all versions sold in Canada. The back seats offer excellent legroom, in response to the demands of Chinese clients who are very fond of SUVs with an adult-friendly second bench. This explains why it offers 50 litres less cargo space than its direct rivals. Cargo volume is 505 litres with all the seats in place but increases to 1432 litres once the seatbacks are lowered, although the floor does not become perfectly flat. The rear seatbacks lower automatically at the push of buttons located in the trunk, which will keep you from wrinkling your elegant Tiger of Sweden suit when loading IKEA boxes. Also note that there are two compartments under the back seats to store electronic tablets, which young families will appreciate. The engines that power the XC60 are the same ones found in the XC90. They are coupled with an eight-speed automatic gearbox and all-wheel drive that comes factory standard on all versions sold in Canada. The T5 gets a turbocharged, 2.0-litre four-cylinder engine generating 250 horsepower and a maximum torque of 258 lb.-ft. The T6 adds a supercharger to the ensemble to produce 316 horsepower and 295 lb.-ft. of torque. The T8 Twin Engine plug-in hybrid gets the T6’s supercharged and turbocharged combustion engine and adds an electric motor supplied by a 10.4-kWh, lithium-ion battery pack for a combined total of 400 horsepower. 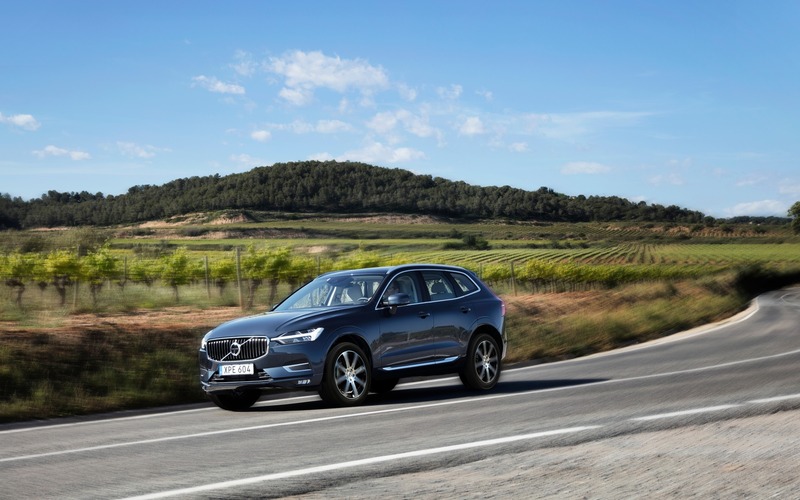 At the introduction in the Barcelona area, Volvo entrusted us with a T6 Inscription loaded to the gills with options including air suspension. Note, however, that the conventional XC60s feature a double wishbone front suspension and a composite rear torsion bar suspension. At the wheel, the XC60 T6 accelerates with remarkable poise despite the fact that it’s heavier than some of its rivals, like the Audi Q5. When Dynamic mode is selected, the response to the accelerator becomes instantly faster and the steering and brake pedal more firm. On the winding roads we explored, however, the XC60’s handling was more comfort-oriented than dynamic. It held the road well and performed safely and predictably, but the XC60 doesn’t really beckon you to drive it in a sporty manner. The base price of the T5, available only in the Momentum version, is $45,900; the T6 will cost you $52,200 for the Momentum, $55,450 for the R-Design and $57,050 for the Inscription; the plug-in hybrid T8 costs $69,550 for the Momentum and $71,150 for the Inscription. You can add several options packages, which vary depending on the version, but that will increase your price. The 2018 XC60 will arrive at dealerships in the fall of 2017. Volvo’s reliability is on the rise as evidenced by the Swedish brand’s above-average ranking according to the 2017 Vehicle Dependability Study by J.D. Power and Associates. This study measures vehicle reliability after three years of use. Volvo had been ranked below the auto industry average in previous years. In conclusion, the XC60 is a true Volvo. Safety, design and comfort are among its strengths, although it’s not as dynamic as some of its rivals such as the Audi Q5 and BMW X3. 7/10	Reasonable considering the T6’s output. 8/10	The XC60 really emphasizes comfort. 8/10	The XC60’s infotainment system has been modified compared to that of the XC90 and is more user friendly. Apple CarPlay and Android Auto are standard. 7/10	Handling is safe and predictable, but the XC60 doesn’t beckon you to drive it in a sporty manner. 8/10	Nice progress that should allow Volvo to keep up its momentum with the new 2018 XC60. Spring has arrived, and we can finally analyse the performance of carmakers on the Canadian sales charts during the first quarter of 2018. Among the winners, or those who registered the biggest gains compared to the first quarter of 2017, we find Genesis who saw its sales increase by 102%.